Better look before you open the door! Post subject: Better look before you open the door! Here's what I saw just as I was ready to open the back door! Is it Halloween? Get the candy. Maybe he was just looking for the cooler and wanted a boat ride? very cool! I have never seen one in the wild. i have a pic of a juvenile bear standing on my front porch in college. there was a mom, 2 cubs and a large boar in the back yard. i proceeded through the house to take pics of them in the front yard. luckily i thought to pull the blinds back before i walked out the front door. there stood the juvenile on the Welcome Mat. needless to say i didnt go out in the front yard to take pics of the others. Come hunt with me a few times. It's a pretty regular thing to see them where I hunt. I tend to get a bit concerned when I see a mom with cubs although I haven't had any problems so far. They recently trapped 150 of them and moved them to another federal refuge that I hunt also. They are trying to give the population a boost at the other refuge, so I guess I'll see them even more now. Some of the guys I hunt with are scared to death of them. They've been known to get in a big hurry to get back to camp after seeing one. On more than one occasion we've had to bring a second climbing stand out to retrieve the first stand because the hunter was in such a hurry to get away that they jumped out of the stand when it was still 10-12' up the tree. For probably 30 years I never ran into a bear anywhere, and I was out in the woods all the time. In the last 15-20 years I have been seeing them on a fairly regular basis. This past fall I saw 2 while archery hunting, had 2 bruisers walk through my yard about 2 months ago, and now this one. Several years ago I had just gotten out of the truck to go shad fishing when I saw 2 cubs run up a tree, then mom came along and partially climbed the same tree and propped herself in a low Y of the tree. She was looking right at me, cracking her teeth, and there was saliva flying out of her mouth. AHHHHH, I think I better not get anywhere near her and her cubs! 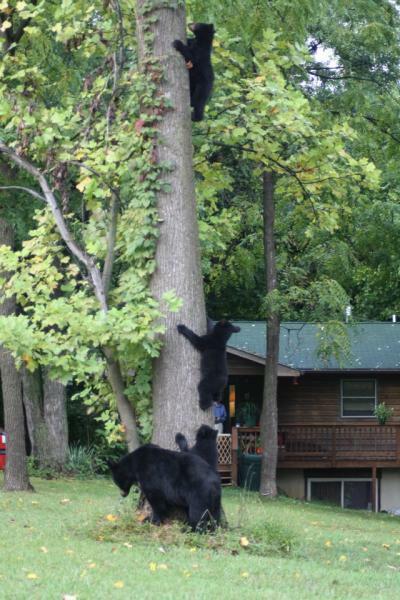 The guy in the tree stand should have seen that, he'd probably give up hunting! i used to see them on a regular basis. this was taken by my in 2011 in my neighbors front yard.